Harry Beautyman fancies a strong Posh finish to the season. Photo: Joe Dent/theposh.com. 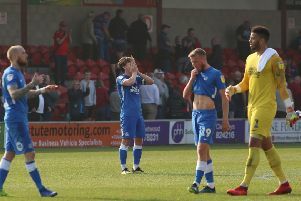 Peterborough United will aim to take their frustrations out on lowly Crewe at the ABAX Stadium tomorrow (April 2, 3pm). Midfielder Harry Beautyman insists the playing squad haven’t completely given up on the play-offs, but he accepts self-inflicted wounds have made it a near impossible task. “We’ve shot ourselves in the foot since we were knocked out of the FA Cup,” Beautyman stated. “We lost our form and we couldn’t get our style of play going. It’s been a very frustrating time. “But we’ve won back-to-back games and now the aim is to win the remaining games and see where that takes us. “The play-offs are still in the back of our minds. It’s a big long shot, but we will be professional and try and get three points from every game starting with Crewe. “We’ve been on long winning runs already this season so you never know.